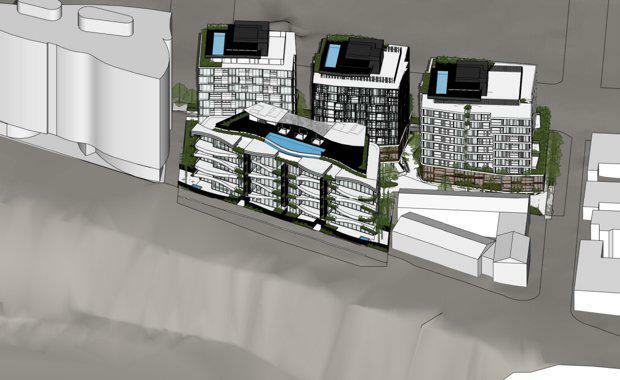 Kangaroo Point’s residential scene could potentially become larger by several buildings at once due to a development application currently pending with the Brisbane City Council. 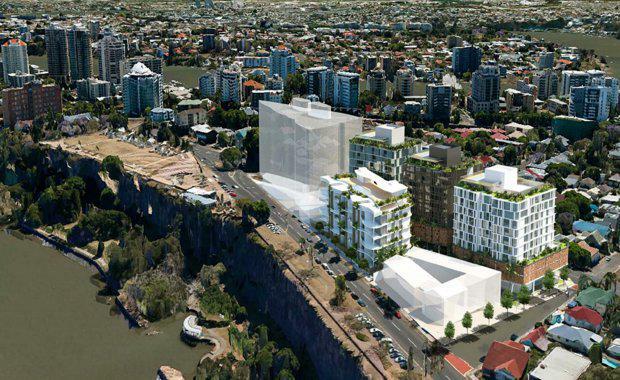 The application proposes seven Ozcare-owned sites on a block in Kangaroo Point, Brisbane, fronting 44-50 River Terrace, 7 Paton Street, and 543-583 Main Street to be amalgamated into one super-site to accommodate for an integrated mixed use development comprised of four new buildings. 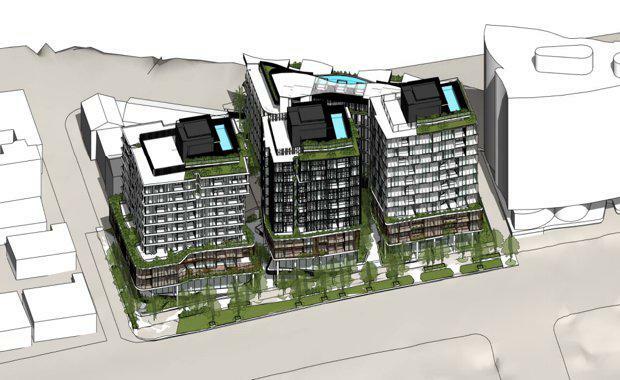 Three of the proposed buildings will be residential apartment towers fronting Main Street and the fourth, while still classified as a residential building, will front River Terrace and offer exclusive premium dwellings. Every one of the four buildings will contain ground floor space that will be set aside for centre activities. The proposed development, in total, will consist of 259 apartments and 1,286 square metres of ground floor space. According to architectural firm NRA Collaboration, each building will transition down in building height away from the neighbouring 13-storey Banyan Tree Residences tower. The tallest building of the development will be 11-storeys, followed by two 10-storey buildings and a five-storey building. Each building will be made up of a mix of residential offerings, ranging from one, two, three and four bedroom apartments. A total of 358 car parking spaces are proposed on site - 318 resident car parking spaces and 40 car parking spaces for visitors. Approximately 2,544 square metres throughout the entire development have been designed to become communal recreation space for residents. This space will feature large, landscaped recreation rooftop terraces, pools, barbecue facilities and significant landscaped open space areas at ground level. With over 1,000 square metres of space at the base of each building, the development as a whole promises to provide a range of engaging commercial, retail and public interest opportunities. The development application said that its developers do not yet know exactly what to incorporate, but that lack of knowing has no doubt paved the way to a future of boundless possibilities. The proposed development has been specifically designed based on the principles established in the ‘Brisbane City Council New World City Design Guideline: Buildings That Breathe’. Brisbane City Council’s New World City Design Guide - Buildings that Breathe provides a shared vision for achieving subtropical building design in Brisbane. New buildings in Brisbane’s city centre, mixed-use inner city, transport corridors and principle regional activity centres are encouraged to embrace Queensland’s subtropical climate by opening up to cooling breezes, providing lush landscaping, shade and comfort. In order to respond to this city initiative, the designers have incorporated significant outdoor open spaces including private balconies with planter boxes on podium levels one and three, which is included in all of the buildings except for the premium tower facing the river. 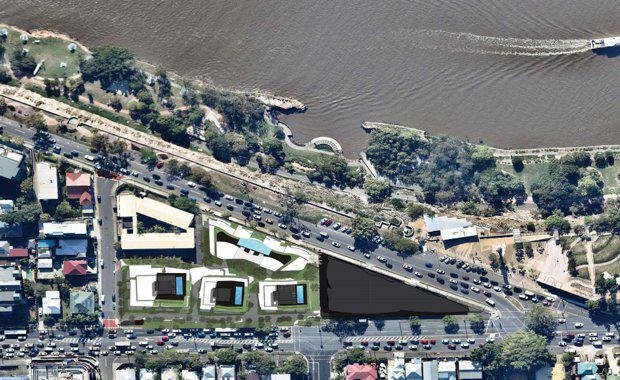 Along with the previously mentioned rooftop recreation spaces with landscaped gardens and pools overlooking Brisbane river and the city, each apartment is proposed to be provided with a private open balcony or ground level courtyard area. NRA Collaboration have stayed true to the idea of breathable buildings and have made sure to incorporate maximum access to sunlight wherever possible and design features that will encourage natural air movement and ventilation. According to the application, the central space between the Main Street and River Terrace buildings will deliver an “exquisite subtropical landscaped environment providing a desirable outlook, privacy and visual amenity”. Due to the close proximity of each building on the single site, design studio Lat27 have chosen to include dense deep planting for screening purposes between the buildings which will provide future residents a green and natural sense of privacy and serenity. “Each of the proposed new buildings has been designed in a unique architectural style to give the appearance of four separately identifiable buildings,” the application said. “This is achieved through the choice of materials proposed and their application to the building facades. “The material selection will be finalised during design development stage, however materials are generally designed to be maintenance free, and to naturally weather in time. Council is yet to make a decision on the application, which was received in April 2017.